Girijatmaj Vinayak Temple of Lenyadri, one of the Ashtavinayak Temples of Maharashtra, is the sixth Lord Ganesh Temple to be visited on the Ashta Vinayaka Mandir Pilgrimage. Located at Lekhan Hills, Girijatmaj Ashta Vinayaka Temple is the only temple of the Ashtavinayaka which is on a mountain and is built in the locale of Buddhist Cave Temples. Lenyadri is situated on the North-west bank of river Kukadi. Here, Lord Ganesh is worshipped as Girijatmaja. The Lord is believed to be his manifestation as an infant. Girija is another name for Goddess Parvati and Atamaj means ‘Son’. This place is referred as Jirnapur or Lekhan Parbat in Ganesh Puran. Lenyadri Temple, located on hill top, is approached after climbing 307 steps. Out of 18 Buddhist caves on mountain, Girijatmaj Vinayak's Temple is in the 8th cave. These caves are also known as Ganesh Gufa. The temple is built out of a single rock and is Dakshinabhimukh- facing south. The Sabhamandap (temple hall) has 18 Overees (small rooms for meditation) within it. 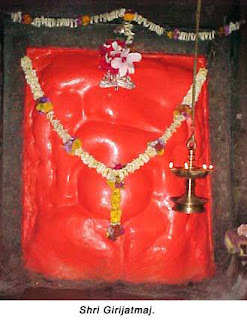 The idol of Girijatmaj Ganesh is in one of the rooms. Lord Ganesh’s image is a fresco carved out into a rock, with his head turned to the left. Devotees can enter the Garbhagriha and offer their worship. A river flowing nearby adds beauty to the temple. All the 30 Lenyadri Caves including the Girijatmaj Vinayak Temple is under the control of the Archaeological Survey of India. Legend says about Goddess Parvati’s creation of a child from the dirt of her body, who is now worshipped by everyone. She desired to see her child as an infant and underwent severe penance to achieve this objective. Her desire was granted and Lord Ganesh is said to have reincarnated himself as an infant and lived in the Lenayadri hills for 12 years. The Panchamrit puja is conducted daily in the morning. Major celebrations are held during the Bhadrapad (August – September) and Magh Chaturthis. In the month of Magh, an Akhand Harinaam Saptah is held. Ganesh Jayanti and Ganesha Chaturthi is celebrated in a great manner with cultural programs. Bullock cart racing is organized on this occasion. Lenyadri is about 94 km from Pune, on Pune - Nasik Highway and Junnar is the nearby town, which is 5 km from Lenyadri. State transport buses ply to Junnar from Pune and from Mumbai. From Junnar, rickshaws, jeeps and buses are available to Lenyadri. Palanquins are available for the devotees to reach the temple on hill top. Pune Railway Station and Talegaon Railway Station are the nearest railway stations to reach Lenyadri Ashta Vinayak Temple. Pune Lohegaon Airport is the nearest airport to reach Girijatmaj Ashta Vinayak Temple.